Boat & Garden Houses: Our experience working with Green Oak means we can design and create that special place for you to relax and enjoy the most from your water and gardens. Bird Watching Hides: We design and install bespoke waterside bird monitoring buildings from simple timber screens to more traditional timber frame waterside buildings. 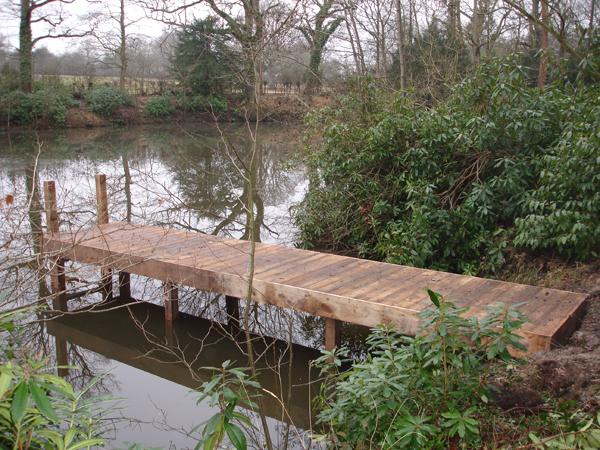 Let us install a bespoke waterside bird watching building to help you make the most from your wetland site. Modular Floating Pontoons: We can source, supply and install the latest in modular floating pontoons. The most versatile way to create the aquatic access you require. Uses include mooring docks, Marinas, casting platforms, Floating Walkways, Aquatic stages, Bathing Rafts, Water Sports Markers, incredibly versatile available in a range of colours and can be secured by deadweight or piling options.